What Will Google Glass 2.0 Need to Succeed? Yesterday marked the end of Google’s Glass Explorer Program. First released with much fanfare in 2013, Google marketed Glass to developers and early adopters. For $1,500, they would get the device and a chance to figure out what to do with it. Since then, Glass users and Google have had quite a ride. The prototype device may primarily be remembered by most for the controversy and ridicule it attracted. Folks worrying about privacy and criticizing its design. Jon Stewart’s “Daily Show” satirically documenting the sad plight of “glassholes” everywhere. The way it was presented, it was easy to forget Glass was an experimental technology, not a finished product. 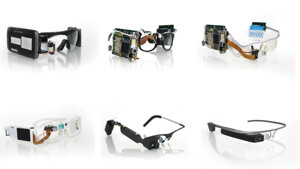 The evolution of Google Glass prototypes. Google regularly tests beta versions of software on select groups to iron out bugs and get feedback before releasing a final version. Glass was intended to be much the same thing in hardware. The challenge, of course, is that the former can be rapidly refined and updated as feedback rolls in—the latter, not so much. Whether the Glass experiment worked as a beta test and market research strategy is debatable. And if Google will continue employing such a strategy with prototype hardware remains to be seen. It’s perhaps of note that a more recent hardware experiment, the Project Ara modular smartphone, will get a lower profile test in Puerto Rico later this year. Although the Explorer Program has ended, Google will continue developing Glass. The team is moving out of Google X, the firm’s moonshot division, to become its own division. The head of Glass, Ivy Ross, will report to Tony Fadell, former CEO of Google-acquisition, Nest, and an Apple executive instrumental in development of the iPod. Ross told the Wall Street Journal they’re already working (out of the limelight) on the next version of Glass for a consumer release later this year—but only when they believe it’s ready for primetime. If and when it goes on sale, the consumer version of Glass will cost less and include an improved display, sound quality, and battery life. The team is also reportedly working to improve the design and address privacy concerns. The new and improved device may target specific users. Indeed, beyond technophiles, professionals were among those most receptive to Glass. Surgeons or industrial workers, for example, already find the device’s hands-free interface of value. This seems the most likely market for the next version of Glass in the near term. And maybe we’ll eventually see the technology get less invasive and the experience improve to the point it takes the world by storm. But we want to hear what you think. Have you tried Glass or did you develop an app for it? What does Glass need to make a consumer version successful? Will it be a mainstream hit, a niche product, or a project quietly consigned to the dustbin?